BBC NEWS | Have Your Say | Should the intruder law be changed? Should the intruder law be changed? The law on the amount of force householders can use against intruders will not be changed, according to the Home Secretary, Charles Clarke. At the moment legislation allows people to use "reasonable force" against intruders. But the Tories want this to be updated so only those using "grossly disproportionate force" would risk being prosecuted. What do you think of the home secretary's announcement? Should householders be allowed to use force against intruders? Tell us what you think. Is the home secretary correct not to change the law with regard to how much force can be used against intruders? Charles Clarke would have got off to a better start if he'd announced at the same time that police forces would be concentrating on intruders and magistrates would be apply sentencing to them in a sensible and even manner. When the police and judiciary clearly can't or won't help then the public must help themselves. Intruders looking for an easy time need not come to my house - my definition of reasonable is no doubt much more violent that of Charles Clarke. No, the law should not be changed. At present you are permitted to use reasonable force in defence of yourself or your family. A change in the law could only see this change to what might be considered unreasonable force. What should happen is that any legal process relating to the individual breaking and entering should be concluded first, and if they are found guilty then they should be disbarred from taking legal action against the people they burgled. Just goes to show just how out of touch with the people this government in particular, and governments in general, have become. Of course the law needs to be changed. Since when did an intruder use "reasonable force" when confronted by a householder? The point is that intruders take a risk entering someone else's property and should suffer the consequences if they get injured as a result of a confrontation. I agree with the Tory line on this. There has to be a better deterrent than the knowledge that a householder can only use "reasonable force" to eject you from their property and the possibility of getting compensation if they use a bit more. If someone chooses to commit a crime then they should lose all protection from the law or human rights legislation. As they are operating outside of the law, they are outlaws and should be treated as such. I feel that the Home Secretary seems to have missed the point. He does say that he believes that a man's home is his castle. Surely, therefore, we not only should be allowed to defend it (using 'reasonable force') but not have to concern ourselves that if we do we ourselves will not become the target of the law. The burglars/housebreakers of this 'free' country or ours must be delighted over the ruling. They can be confident that if they do get caught by the house owner they can be handsomely compensated for any scratch, bruise or bloody nose that the nasty but innocent house owner inflicts upon them. Let us put a notice on our front doors "All thieves welcome. Just come in and help yourselves. We won't stop you!" Even the police seem pleased when someone 'has a go' but they have to carry out the law, often by arresting the person who has been robbed! Justice? I'm not at all sure about that! Does the law need changing, or just peoples' perception of what it means? Let's get the clarification of the current law that it is said is needed then decide. I imagine a lot of people who want it changed have a warped view of the current law as hyped up by the media. Until the police turn up when you call them and not four hours later then yes we need a change in the law. I can't believe the police just expect us to stand by and let a criminal rummage through all of our stuff, then let them leave! We might as well be asking them if they want a cup of tea while they're at it! I think a major change that should have happened is the ability to guard your home against intrusion - with barbed wire, or broken glass on wall tops. I don't wish to do such a thing, but don't know why anyone should be prosecuted if a burglar is injured by them. My mother's house was broken into while she was asleep upstairs. What do you think would have happened to her if she had disturbed them? It doesn't bear thinking about. People need more protection in their homes. The criminal minority must be held accountable for their actions and punished. If I had been in the house and attacked them you can bet your life I would have been the one in the dock! I, for one, am glad the law is not going to be changed. Despite what the popular press would have us believe home owners are not prosecuted for using force against a burglar unless it becomes an act of revenge and they attack someone who is leaving the scene. Good for Charles Clark. I don't want to live in 'an eye for an eye society'. The law needs changing and so too does the new home secretary. Don't let him mess up law and order in addition to education! The home secretary can say whatever he wants to say because after all he has got police protection 24 hours a day and will never have to face the kind of situations ordinary people are forced to face. Why have the Government taken 7 years to discover that this law suddenly requires some clarification? Could it be the impending election? Prevention is better than cure: the matter of importance is reducing the number of active criminals by improving the lives of people who turn to violence and burglary. We do not need to tinker with the legal system, and the government is, in my view right to simply clarify the law. Many see criminals as the undeserving underdogs of society. It is us, the happy majority, that put them there. Surely if you come across someone who has broken into your house, it is better to be in prison for defending yourself than in the morgue for trying not to break the law! There are only three groups who don't want the law to be changed: Criminals, because it would affect their activities, lawyers, because it would affect their livelihood, and politicians, because a cowed populace is easier to control. Which one of the 'no change' groups are you? I'll still use whatever force I see fit to protect my hard-earned assets and above all my family. However, Labour has now lost my vote. They are too lenient towards criminals. Question to Charles Clarke: tell me what you expect me to do, a 30 year old woman, when confronted with a male intruder in my home. Go on; tell me how I can protect myself. The truth is I haven't got a hope unless I have a gun. The law as it stands is about right. Prosecutions of householders are rare because most have the sense not to shoot a fleeing intruder! The current law is working - the only person who's been prosecuted recently was someone who fired a shotgun into the back of a fleeing youth. That's unreasonable force, and he went to prison. Can we please stop this hysteria? I grew up in the UK and seen from an early age that the laws seemed to protect the elite. It's still the same, armed guards are a common sight when it comes to nobility but the commoner can't lift a finger to protect their homes or families. I say let every British citizen be given the right to carry firearms and criminals should be put on notice, break the law suffer the consequences. The only two times in my life I was mugged, I was in London. In Texas I have never heard a gun shot in anger, not felt threatened. I suppose it's because if you're a law abiding citizen, you have the right to protect yourself. Lord knows the criminals will protect themselves as well. No, the law is sufficient as it is. Two recent high-profile cases show that those using "grossly disproportionate force" have been quite rightly prosecuted. Shooting the intruder in the back while he was running away and stabbing the intruder umpteen times clearly fall into this category. I don't understand what the fuss is about. 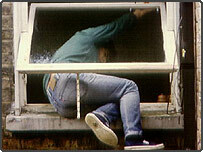 Stuart in Glasgow: I'm sick of hearing about how the burglars are victims. They should earn a living by hard work instead. There's plenty of it around for those willing to work instead of destroying other people's lives. I cleaned public toilets for three years - so I don't want to hear about only the 'wrong' jobs being available (as if burglary was a 'right' job!). There is no excuse for breaking into someone else's home; such intruders are morally bankrupt and deserve no protection from the law. Sentiments like Stuart's in Glasgow are typical of the bleeding-heart liberalism that is destroying any sense of justice in society. Perhaps he would like to erect a sign outside his own home making it clear he welcomes being robbed and assaulted and let the rest of us deal with them as required to protect ourselves and our property. Vulnerable indeed, what a crock! Having the law weighted against the law-abiding serves to encourage the criminals. The more criminals there are the more work there is for fat cat lawyers. The criminal justice system of this country is nothing to do with criminals and nothing to do with justice, but is everything to do with greed and corruption which goes to the very top. I do not think the law should be changed. Many people who are driven to house-breaking are among the most vulnerable in society - desperately seeking a source of income. Yes, for many that may be to feed an addiction, but shouldn't the government look at remedying the root of the problem? Is it really going to build a better society by giving every householder in the UK the right to potentially seriously assault another citizen? In short yes. The law is too soft on the offender. Someone breaks into your house, to either rob you, or assault you or even worse. And you are expected to make a rational judgement. Only in extreme circumstances should the householder be made to account for his action. One law for the rich and famous and another for the rest. If you break into Buckingham Palace or No 10 Downing Street, you are threatened with armed police and soldiers. Any poor person will be prosecuted for using force deemed unreasonable by the people protected by armed guards. It is time the same rules applied to all. The householder should not feel that they're taking a risk by defending their family and property. Yet again the Government fails to act to protect the law-abiding. Anyone confronting an intruder in their home should be able to use whatever means necessary to defend themselves without fear of being prosecuted. If the intruder wasn't breaking the law in the first place, these situations wouldn't arise. It's about time the criminals were fearful about the consequences rather than the householders. Of course they should be changed. It is ridiculous that you have to use "reasonable force" against an intruder. This is something that can be argued about and hence leaves the law-abiding home-owner at risk of being made a criminal. When someone illegally breaks into your home, they should not be protected by any law or statute. Another spineless, ineffective and unsurprising "decision". If Mr Clarke thinks that there is no need to change the law as it stands maybe he should consider instead whether householders should have legal protection from frivolous claims for compensation from intruders injured during illegal entry onto their property. Absolutely, the law should be changed. Those who deliberately break the law do not deserve the protection of the law, it's as simple as that. Ministers with their chauffeur-driven limousines and round-the-clock armed guards have completely lost touch with the general public.